These uniquely sculpted marble limestone boulders are on the beautiful Columbia College campus in a small nature preserve known as the Arboretum. They have a fairly short approach past a peaceful lake. The Triple Cracks is the classic. 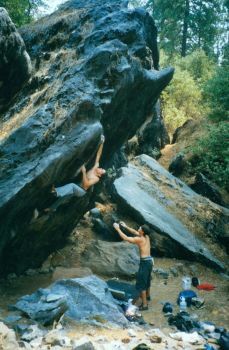 The steep walls and boulders around it also have many other excellent problems from V0 to V10. *There has recently been a gold rush of first ascents growing in intensity into gold fever in the last few years so there is now well over 100 great problems in the Arboretum area alone and that number is constantly multiplying! The Falkenstein Triple Cracks V6/7**** stand V7/8**** sit V8/9*** traverse into sit, Double Cracks V4*** stand V5*** sit, Triple Cracks Traverse V8***, Gold Wall V4*** or Gold Wall Direct aka The Pinch Problem V7/8***, Lobster Claw V3/4*** stand V5*** sit, both of "The Dancefloor Problems" The Swing V9/10*** and The Waltz V9/10***, Trogdor V3*** stand start or V4/5*** low right start or Ultimate Trogdor V7/8*** low left arete sit, Gold Rush V3/4/5? ***, actually almost all of the problems on the Columbia Limestone are super ultra mega classic!! Which SuperTopo guidebooks cover Columbia College? Andrew Zaslove does The Black Forest Arete.